Short answer: Making people safer by teaching them how to avoid fall injuries. Longer answer. I discuss: Why we fall; Where we fall; The economic aspects of falls (cost to the economy, businesses, insurance and legal issues); and most importantly, how to avoid fall injuries. 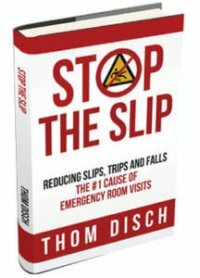 The book includes 40 real life stories of people that have experienced fall injuries and 50 charts and tables that depict the significance of the problem. My company manufactures products that serve people with disabilities. We were working on developing a new product line to help people avoid slip and fall injuries. When I started to research the target market for this product line was I was shocked. Every person I talked with had a personal story about how a fall injury affected someone in their life. I couldn’t believe this everybody had an emotional connection to the fall injury problem. I knew then that I needed to write this book. I use forty of these very personal stories to help readers connect with the fall-injury problem. Falls kill 7 times more people than the flu and 3 times more people than violent gunshots. Falls cost the US economy over $150 billion per year, which is more than 1% of our GDP. Most fall injuries are preventable, yet the most amazing thing is that nobody is talking about the problem. The biggest lesson I learned is that first step in making people safer from is to help them understand the extent of the problem. That was when I realized that I needed to write this book. Writing is challenging. The book took me over two years to write. In the beginning, I tried to write during the middle of the day as a part of my normal work day. I would come into the office and try to write in between all the other things that were going on around me. It took me a long time to realize how unproductive that process was for me. After 18 months of effort I realized I had pulled together a good outline and compiled a lot of very interesting facts. But I needed to change my process to do the actual writing. It was then that I decide to change my workday. I set my alarm for 4 AM and got up, locked myself in the basement and wrote without interruption or distraction until 8 or 9 AM. For me this focused effort allowed me to complete the book. I think everyone needs to find the process that works for them. In a word: Serendipity. A little over 20 years ago I was in the consulting business. The consulting firm that I was managing was sold to a larger firm. I was out of a job. On a whim I went to look at a commercial building that was for sale. During the tour of the building I asked about a business that was active in part of the building. Turns out the guys who were selling the building had just bought the building and this business at an auction and they were liquidating everything. A little more discussion and I found out that this business, HandiRamp made ramps for people with disabilities but because of the founder’s death the business was failing. After a little negotiation, I convinced the sellers to sell me the building and the business. This was perfect for me, I could help people and I had the opportunity to apply all that I’d learned in business school and while consulting to grow my own business. Twenty years later, here I am. As a good friend of mine says about entrepreneurship: “If it wasn’t for employees and customers this would be a great business!” It seems that my days are spend being the ombudsman. I become the go to person that helps solve both customer and employee issues. I must admit that I love the new opportunities that surface each and every day. The fact that each day is unique and challenging in its own way really makes me happy. The fact that I can do this while giving back to the community is more than I could have asked for. Yes dozens, maybe hundreds. Harvey McKay and his first book How to Swim With the Sharks and his unique approach to marketing that book. Jonah Berger, Contagious, and Chip and Dan Heath, Made to Stick, that helped me to understand what might help enable an idea to go viral. At one point when I was teaching I went through improv training at Chicago’s Second City to improve my speaking skills and my ability to connect with my students. During that time, I actually performed on the main stage there a couple of times. We have thought about starting a not-for-profit foundation to fund a campaign to increase awareness of the fall injury problem. During our research for solutions we determined that the first step in reducing fall injuries is increasing the awareness of the problem.